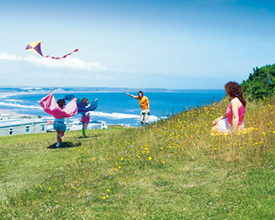 Reighton Sands' green and spacious clifftop areas seem to be perfect for kite-flying, family picnics or striding off towards Flamborough Head - the beach stretching endlessly into the distance. Enjoy an easy going pace, next to the lively buzz of Filey and Scarborough. Fill each day in just your own way - Maybe start off with an energising family Wake 'n' Shake session, followed by a morning in the indoor pool complex, or trying out the Mini Archery sessions? Worked up an appetite? Lunch out in the brand new Mash and Barrel: Lounge-Bar-Cafe. You'll need to refuel before heading out to spend the afternoon exploring Yorkshire or learning some new skills in Fencing coaching. Time enough to get glammed up before heading off to the ShowBar for a drink, live music and dancing. 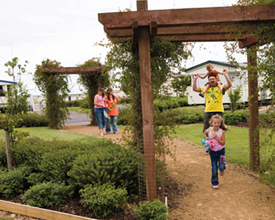 Whether out and about or staying on Park, you're sure to have a great holiday at Reighton Sands. 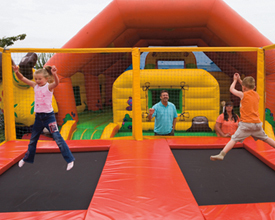 Reighton Sands Holiday Park offers the following facilities. Reighton Sands in Yorkshire overlooks a broad sweep of sandy beach and is within easy reach of Scarborough, Whitby and the North York Moors. There is so much to see and do in this beautiful part of the country like Bridlington with two great beaches and an award winning promenades which are packed with fun. Bempton Cliffs Nature Reserve form part of the largest seabird colony between Flamborough Head and Brempton. There are over 200,000 birds breeding in this area during the busy months of April and August. Let the daily routine slip away at Filey a traditional English seaside resort and is a fishing town on the North East coast of England. 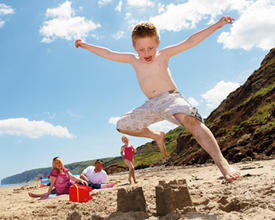 Filey is the perfect location whether you prefer an active holiday or whether you would just like to relax. Most of the town stands above the sea on a cliff which provides beautiful views of the bay below. The bay runs from Filey Brigg to the chalk cliffs of Speeton, and with its 5 mile stretch of sand it is a perfect place to enjoy a leisurely stroll. For the more active kids try Eden Camp a fascinating World War II museum based in an army camp with an assault course for children. 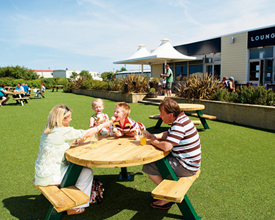 Have you been to Reighton Sands Holiday Park? Please submit your review so that others can benefit from your experience. Important note: Information provided here about Reighton Sands Holiday Park is based on our best knowledge. However, please check with Reighton Sands Holiday Park before booking to ensure that you have the information required. Reviews are the sole views of the contributor and do not necessarily represent the views of CampsitesandCaravanParks.com or Reighton Sands Holiday Park.